Book and type designer Charles Nix once told be that the goal of a successful book design is that it becomes invisible. It steps aside visually and allows the words to flow over the reader, in essence, allowing them to get lost in the story. 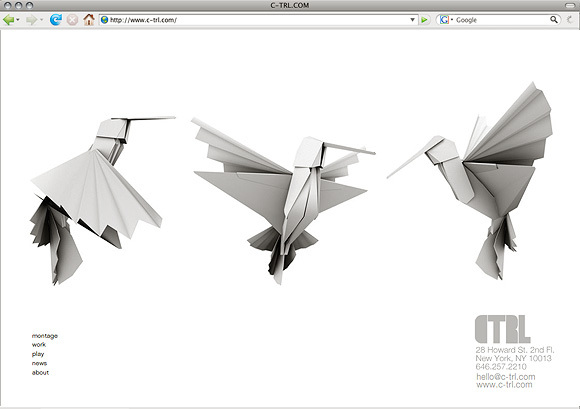 Such was the case when developing a web presence for new media studio CTRL Labs. Here, the challenge lay in building a website that compliments, and does not compete with the stunning work it contains. Defined by Media was called in to develop a database-driven flash interface to seamlessly display CTRL's recent work as well as their personal endeavors. The result is a user experience that puts the the work at the for front with a structure that allows efficient, client updates for years to come. 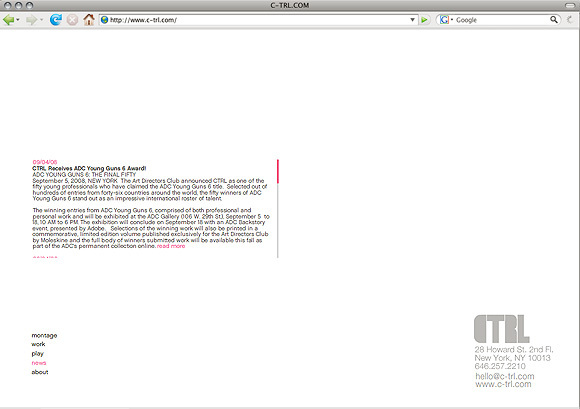 On the technical side, all the complexity of the CTRL Labs site is "under the hood." With a MySQL content management system (CMS) feeding data in real time to a flash driven website (through PHP and couple of other geeked-out goodies) the site allows anyone to update, rearrange, and edit the content without costly fees or lengthy downtime. Design and develop the CTRL labs portfolio interface. Integration of existing PHP-driven MySQL database. Consistently fresh website through ease of updates.